If you ever hope to buy a President Lyndon Johnson signature, or own a Lyndon Johnson photograph, this is the book to own. If Mr. Bridges had done no more than publish the chapter entitled “Signature Study,” this book would be a must for ever dealer in presidential autographs and every collector. But that chapter is only 36 pages in a work of 250 pages. 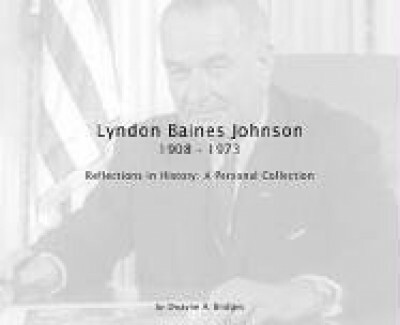 The rest of the book has virtues that make it a must for lovers of historical photos, speeches, and letters in general, and of Lyndon Johnson in particular. The first thing you notice about this work is the respect the author has for photographers (people not normally given a great deal of respect). All portraits are conversions between the artist and their sitter. This is true between photographers and their subjects. Look at the spontaneous photo of a young, awkward Lyndon Johnson—taken in 1946 while on the campaign trail—and compare it to the poised, mature Lyndon Johnson in the Senate chamber—taken by Arnold Newman in 1953. Mr. Bridges is right to say in his introduction that we “ gain insight told through the photographs.” He shows us seventy photos, many of which have never been seen before. In these photos we see Lyndon Johnson campaigning, being presidential, and relaxing with his family, but never being bored or boring. Lyndon Johnson may not have been charismatic, but he was exciting. We see LBJ with Gene Autry, Arthur Godfrey, John Kennedy, dogs, nuns and fellow politicians. In addition to his respect for photographs, Mr. Bridges is also respectful of the facts (another quality I do not see enough of, especially in books on autographs). In this book, we see a wonderful Harry Truman letter explaining his hopes to help elect a Democratic president, and next we see a photo of Truman with Johnson together on the campaign stand, with the speech Johnson gave that day! For me, the photos say more than the speeches. The combination of photo, speech, and autograph create the atmosphere of the 36th president. You feel you are in his world. This book is a collection of collections, and Mr. Bridges is meticulous about crediting where and from whom he obtained his items. But this is now more than just a collection. Thanks to the author’s hard work, attention to detail, and knowledge of photos, signatures, time, and place, we get the best study on Lyndon Johnson and his signing habits yet.